We developers are, on the whole, a lazy breed. It goes with the territory, I think. And I’m not talking about common low-grade laziness here. I’m referring to total commitment laziness: being prepared to put in an extraordinary amount of effort to avoid doing something. The canonical test for this is to make someone perform a task that will take 8 hours of repetitive work to perform in Excel. The non-programmer will just do the work. But a natural developer will be too lazy to do the work. Instead she will spend 7.5 hours writing a program to automate the task. And even if the task would only have taken 3 hours, a real developer will still spend 7.5 hours writing an automated version. This transcendental form of laziness - being prepared to expend more effort than necessary simply because you’re too lazy to do the work - is what I’m talking about. For the most part, it’s a Good Thing: the ability to notice and avoid unnecessary work is a useful trait in an engineer. However, it has its downsides. Devise a dialog especially for the task at hand. Prototype it. Run usability tests, focus groups, etc. Employ graphic designers to create a visual design for the dialog. Get developers to implement the dialog and the code behind it. Re-employ graphic designers to explain to the developers exactly how they failed to execute on the exquisitely-crafted design vision. Get developers to re-implement the dialog. Iterate the last couple of steps until it looks right and works, or until nobody cares any more. Ship it! Call the MessageBox API. Ship it! Anyone truly committed to laziness will find this unacceptable. Every time such a dialog appears, we are making the user expend some mental effort to map between the generic Yes/No labels and the outcome. If your software gets used a lot, the sheer volume of unnecessary work this generates is unbearable. Oh! The humanity! Clearly the efficient (i.e. 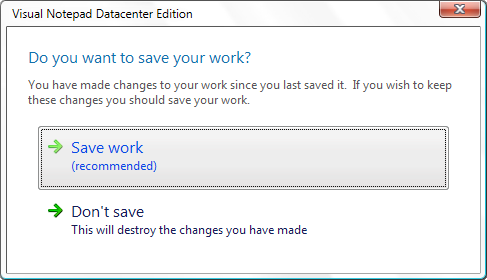 lazy) solution is to provide a UI that doesn’t require the user to translate Yes and No into Save and Discard. We should just make the buttons say what they mean. And as mentioned in the my previous entry (on command links) the Vista style guidelines encourage us to move in this direction. While in the long run, making life easier for our users will easily balance out the initial effort required at development time, the mere presence of extra effort at any stage will surely set your lazy senses tingling. In an ideal world, we could offer the improved user experience without having to write a dialog from scratch. Wouldn’t that just be heaven? Enter Vista’s new Task Dialog. Just like MessageBox, the Task Dialog saves you from building a custom dialog from scratch. But it gives you the option of building a better dialog than you can with MessageBox. OK, so it’s not exactly the same. It’s a slightly different icon. We’ve lost the redundant disabled close button. Also, notice how the grey section at the bottom has a slightly darker line at the top, which is rounded off at the edges. And more interestingly, we have a main question and a note beneath it. This lets you ask the question succinctly, and then provide a slightly more verbose explanation beneath if necessary. But that’s not terribly interesting as it still suffers from the same basic problem as the previous dialog: meaningless button labels. That’s what you get if you use the basic TaskDialog API - a slight upgrade on the basic message box. Obviously you wouldn’t want to switch all of these features on at once. (Except perhaps to see what it looked like. And yes I did. I’d describe the result as: crowded.) Just pick the options that make sense for your scenario. And you’ll never want to use MessageBox again!